Book Review: SHERLOCK HOLMES ON SCREEN | Birth.Movies.Death. An extraordinary, hugely readable examination of over a century of Sherlock Holmes in movies and on TV. There are few fictional characters who have been cinematically interpreted and reinterpreted as often as Sherlock Holmes. From the very earliest days of silent movies to thousands of movie screens this Christmas, Holmes keeps coming back to our screens, with each iteration revealing just as much about the audiences of the time as about Sir Arthur Conan Doyle's famous detective. 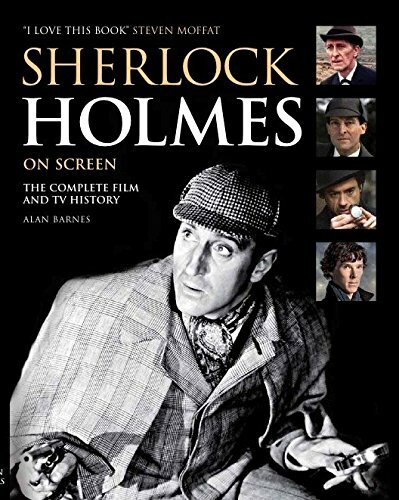 Alan Barnes' Sherlock Holmes On Screen is an encyclopedic overview of Holmes' cinematic - and televisual - history. It's an extraordinary work that manages to be both incredibly informative and hugely entertaining. BOOK TITLE feels exhaustive in its cataloging of the appearances of Holmes (and his relatives and descendants) on TV and film, but it's not an exhausting experience because Barnes leavens out the nitty gritty details with wonderfully snarky reviews of the films and TV shows. Sherlock Holmes On Screen has it all, starting with Sherlock Baffled, a silent film parody that finds Holmes unable to find the burglar who is burglarizing his own apartment at 221B Baker Street. Barnes charts iterations famous and obscure, including a Teenage Mutant Ninja Turtles Adventure and John Cleese's terrible The Strange Case of the End of Civilization As We Know It. Barnes approaches the films with snark, but also with genuine affection - whenever possible he searches for something positive (or at least faithful to the canon) in the motley assemblage of homages, parodies and adaptations. As a casual Holmes person Sherlock Holmes On Screen is a treasure trove; my copy of the book is dog-eared at the pages of movies I need to track down. I've never heard of many of these films, but Barnes fills his reviews with not just strong, witty writing but also a ton of behind the scenes and background info. I haven't seen Sherlock Holmes and the Voice of Terror, but now I want to, and when I do I'll know all about the film's problems with the British board of censors. And of course the movies and shows that I do know are still covered in great detail - Barnes especially loves the new BBC Sherlock series, and gives terrific behind the scenes information, including discussing the original, unused pilot. If I have one complaint about Sherlock Holmes On Screen it's that the book lists films alphabetically, in encyclopedia format. That means a solid third of the book is dedicated to "S" titles. It also means there are a ton of hidden gems hidden throughout that are easy to miss. I would have preferred a chronological format that would allow the reader to trace the evolution of Holmes films over time, but the current format does allow for terrific browsing. Stop on any page and you'll be rewarded with something fascinating. Sherlock Holmes On Screen feels like a necessary reference work for any film fan's library, whether or not they are a Holmesian. It's the best sort of movie book - the sort that sends you scrambling to watch more movies.